On a recent trip to Wichita, I decided to branch out and try some “non-Kansas City pork barbecue” to see how it compared with what I’m used to. I did a short search online and decided to try a place I read about called 2 Brothers BBQ. 2 Brothers BBQ actually has 5 locations in the area, with 4 of them being in Wichita, and the 5th one being in El Dorado. It is owned and run by brothers Mark and Matt Ryan and their parents Tom and Carole Ryan. The location I tried was their “West” location at Central and Tyler out in west Wichita. I thought the place was a bit out of the ordinary when I walked in and saw smoked meats on a salad bar. I began to wonder if I was in the right place until I turned and saw the regular menu on the wall and felt a wave of relief! I went on to learn that the salad bar, known as the “Smokin Salad Bar”, offers smoked meats as salad toppings, which suddenly made the idea of eating salad sound a lot better! However, I had gone there to eat pork, and lots of it, so I looked at the menu and opted for the “2 meat dinner”. I chose pork ribs and pulled pork as my meats, and baked beans and potato wedges as my sides. Choosing ribs as one of the 2 meats added $0.99 to the total cost, but it was a decision I figured would be worth it. It turned out I was right. The ribs were delicious! They were tender and meaty, and served without sauce so you could choose which of the 3 sauces on the table you wanted to use. Amazing BBQ…probably close to you. The pulled pork was very good as well. It might have been a bit salty for my taste, but that was more than made up for by how tender the meat was, and how little fat there was in it. The meat had a good hickory smoke flavor, and it paired really well with their “sweet and zesty” barbecue sauce. Had the ribs and pulled pork not been enough meat for me, I wouldn’t have needed to worry, as the baked beans have a lot of tasty smoked pork in them too; a pleasant surprise to say the least! Being located in the Wichita suburbs for the most part, and offering smoked meats on a salad bar, 2 Brothers BBQ is certainly different from the classic Kansas City barbecue joints I’m used to, but it’s certainly worth your time if you’re in the area and craving some high-quality barbecued pork. With 4 locations to serve you, hopefully you’ll be able to find one and give it a try before long! P.S. We caught up with a few of the Kansas Pork Association folks over dinner not long ago. We talked them into sponsoring some giveaways to add a bit more fun to the blog. Today will be our first giveaway. We want to challenge you guys a bit, so the first person to answer this question gets the giveaway. 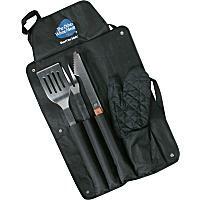 This week’s giveaway is a barbecue set. It has an apron with pockets for the fork, spatula, and tongs that come with in the carrying case. Just in time for more football. Question: What’s the origin of the word barbecue? When I first moved to western Kansas, I used to like to stop in at a little friendly mom and pop corner gas station in Stockton, Kansas. It was a nice change from the normal franchise convenience store atmosphere. Like a lot of small town businesses, I stopped by one day, only to sadly discover that it was closed. Unfortunately, the building sat empty for quite a while. This year, the old corner gas station was given new life as the home of Shirley May’s Deli. The deli itself is not new, but the location is. Shirley May’s has long been associated with the grocery store up the street. The deli was originally located in the back corner of the store. The new location is certainly an improvement. There is ample parking and you no longer have to wait in the grocery check out line, just for a sandwich. My first impression was about how clean the place is. It may have once been an old gas station, but I think you could eat off the floors now. (Not that you would want to, but you could.) My next impression was about the great selection. I counted nearly thirty varieties of cheese. The meat selection was any pork lovers dream. Nearly thirty deli meat choices included sliced roasted pork, smoked ham, honey ham, black forest ham and maple ham. I didn’t even know there was maple ham! Shirley May’s = Amazing ham and cheese selection. The price of a sandwich was $4.99, which just barely beats one of those yellow franchise foot longs. The food however, beats a franchise deli foot long to no end. I had a roasted pork sandwich with colby-jack cheese on fresh potato bread. My wife had a black forest ham sandwich. 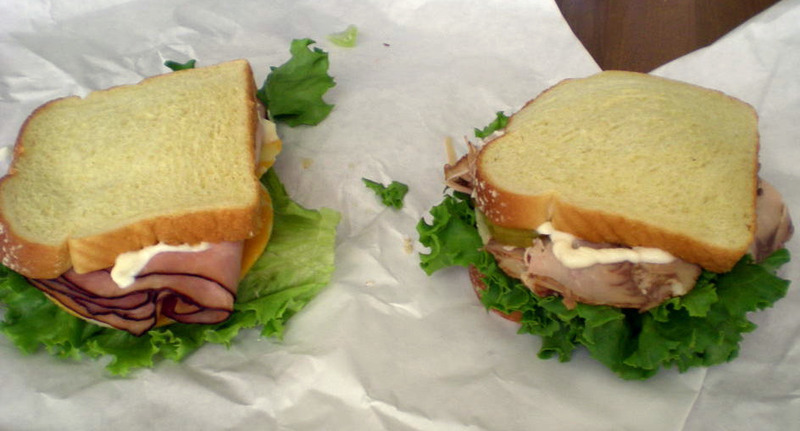 Both sandwiches looked and tasted absolutely delicious. In addition to sandwiches, you can get a soft drink or cappuccino while you shop a selection of bbq rubs, spices and equipment. They also have a refrigerated case with salads so big they could be a complete meal on their own. Upon leaving the deli, I noticed a bbq smoker next to the front door. How can you go wrong with a place like that? !